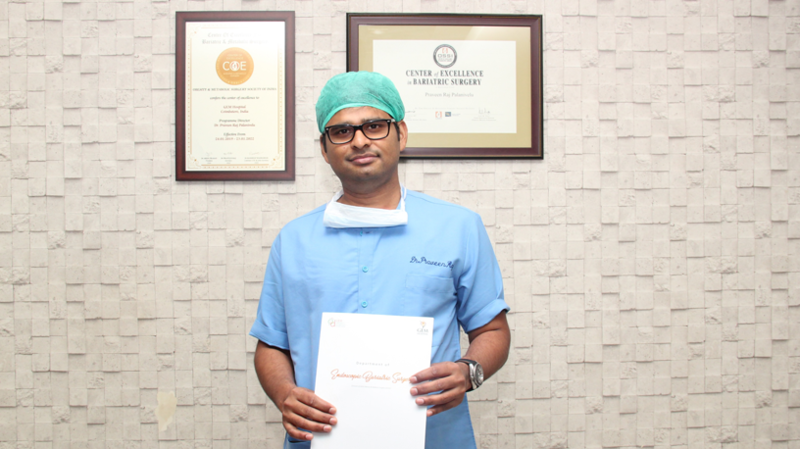 Coimbatore : A procedure similar to Bariatric Surgery intended for the treatment for Morbid Obesity and diabetes, can now now be performed using the upper GI endoscopy without the need for an actual surgery. This is called Endoscopic Sleeve gastroplasty, performed using a specialised device called Apollo Overstitch inserted through an endoscope, which reduces the volume of the stomach hence causing a permanent restrictive effect, Head of Bariatric Surgery Department of Gem Hospital Dr Praveen told reporters here today. It also causes changes in intestine derived hormones which reduces the appetite and increases the energy expenditure rate, enabling weight loss, he said. A specialised training is required to perform the procedure andintroduced for the first time in South India at the Hospital, Praveen Raj said. Stating that all morbidly obese individuals who are unable to lose weight by conventional means are eligible for the procedure, he however said, specific indications include patients with a BMI (body Mass Index) of 27-35, patients unfit for a bariatric surgery and patients anxious about having to undergo a bariatric surgery. The introduction of endoscopic procedure is more for patients who fear going under the knife for the purposes of weight reduction and should be a big draw amongst the patient community, Praveen Raj, who is also the President of the International Excellence Federation (India Chapter). said.